Rear cockpit now done, although lots of details left to do. 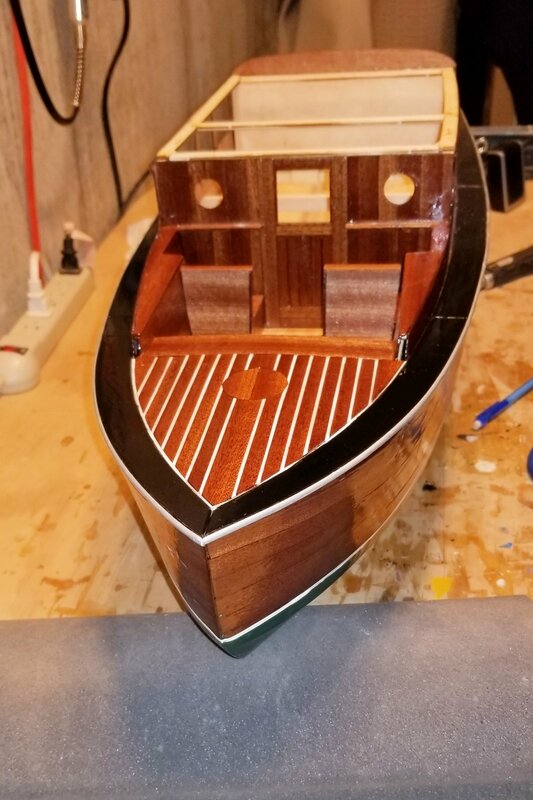 The cabin roof is still not glued on, and the mahogany trim below it needs to be finished once the full handrail is done. The front seats are also just dry-fitted, but the rear is all glued in. 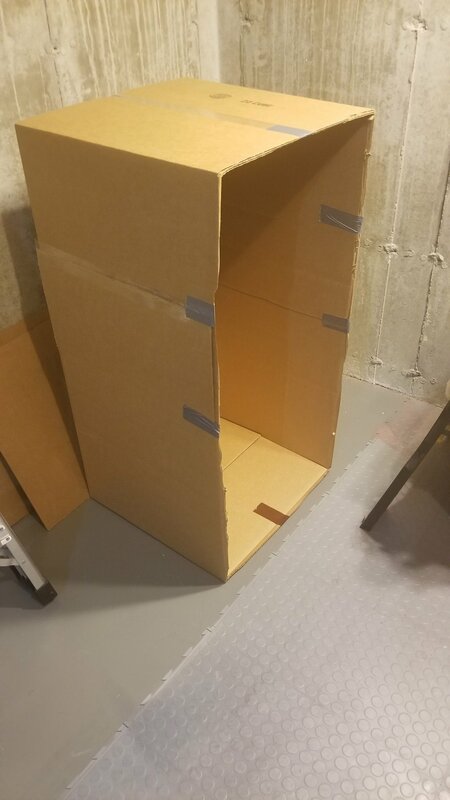 Because it's a static model, I skipped a step to make part of the rear deck removable. The instructions are interesting -- they say to finish the seats "with your favorite material", which implies regular varnish. 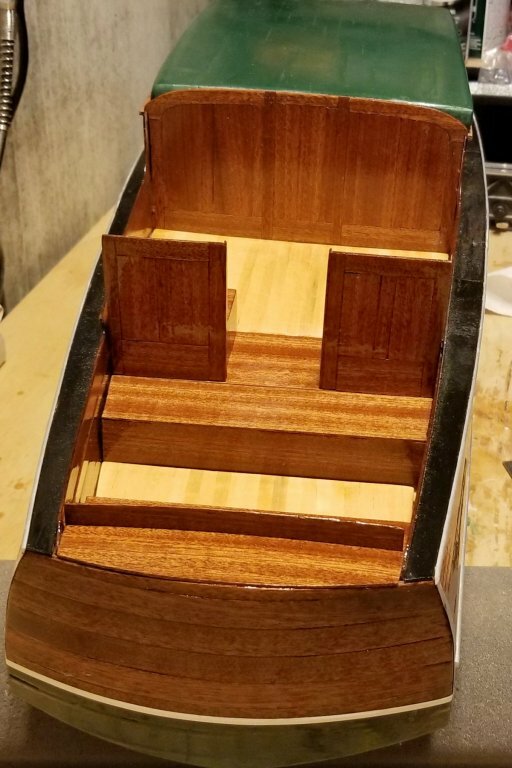 That would be simpler, but it leaves the seats out of step with the finish on the rest of the boat, so I did all of the rear (and the front seats too) with the epoxy/spray treatment. The epoxy/spray is not something you want to do a piece at a time, so I'm doing it in batches. My plan is just one more batch after this if construction permits that. Cabin roof is done. 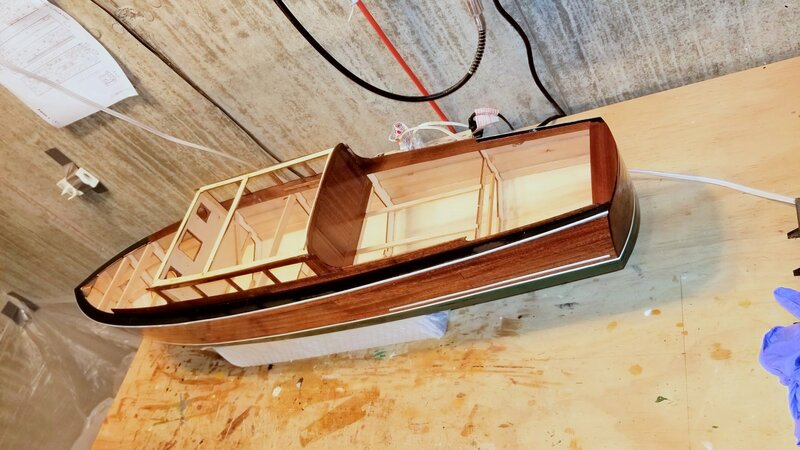 The mahogany roof edging you see is attached to the boat and isn't finished yet. 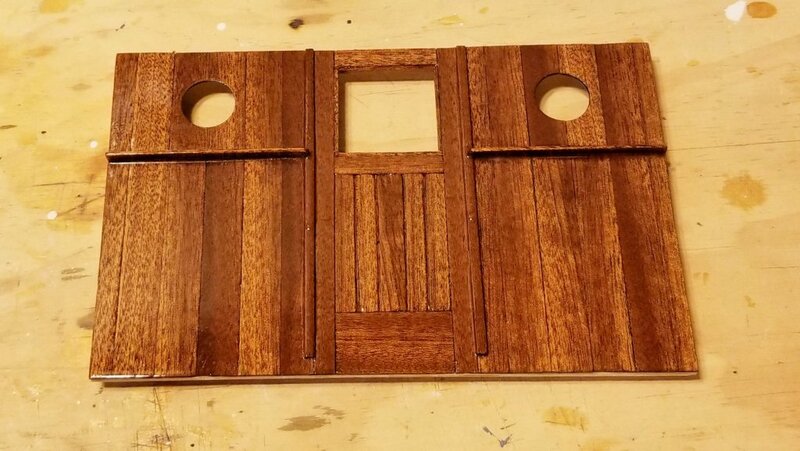 I'll finish it along with the mahogany in the rear. The roof is still removable and I won't fix it until the end. Here's the finished cockpit. The seats are done but only dry-fit for now, because I need access to detail the instrument panel before I glue them in. 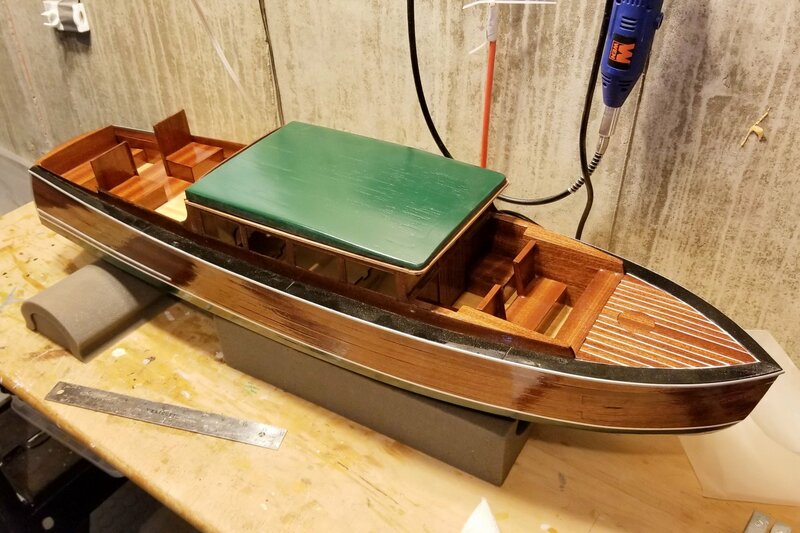 They will also have hunter green seat cushions on the completed boat. I provided a few views, because the finish is so glossy that in some views you get weird light reflections or wood colors. That doesn't happen to the naked eye. 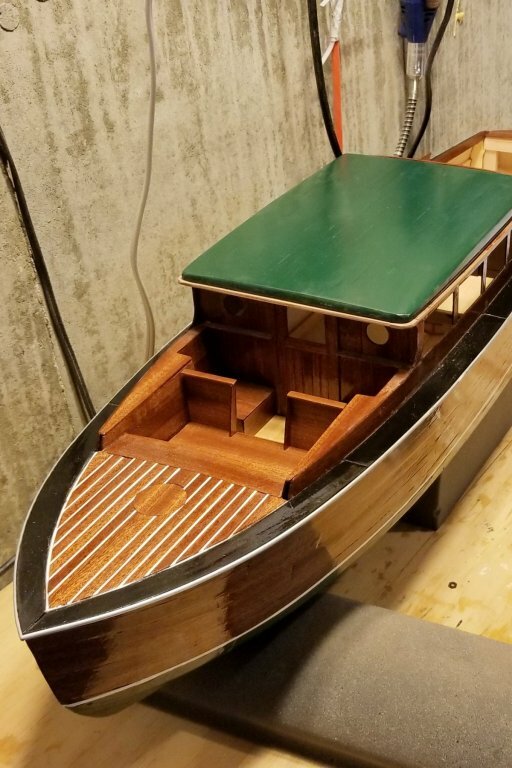 Front deck and cockpit after 1st coat of epoxy (not sanded). 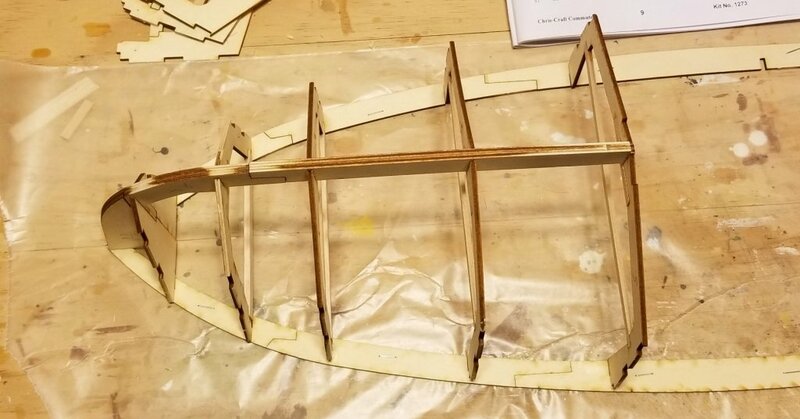 I've finished the basic structure including the hull, side frames, sideboards, and front and rear cabin bulkheads. I followed the Dumas pictures and painted the sideboards black, and I like the look. Getting better at working with the epoxy. My learned techniques to date: (i) heat to 100 degrees + in a light box, (ii) small batches, (iii) keep the light on and put the mixing cup next to it to keep it hot while brushing the epoxy on. Now on to the front cockpit. I'll put the rear fenders on soon as well. Here are the two cabin bulkheads, finally finished. I did the 3 coats of epoxy + wet sanding called for in the manual, but then just did one coat of the "wet look" spray lacquer. The instructions say 3-4 with more sanding, but they look great after just one coat -- which is fine, because this finishing process goes on and on. Here's a picture of the hull after the third coat of epoxy, but before I have sanded it. I think the epoxy really brings out the mahogany, and it looks good against the hunter green. The white flecks are light reflection. Staging this is tricky. I have finished what you see, the cabin front and back bulkheads, and the cabin sides through three coats of epoxy. The next finishing step is more wet sanding, and then "wet look" spray varnish. 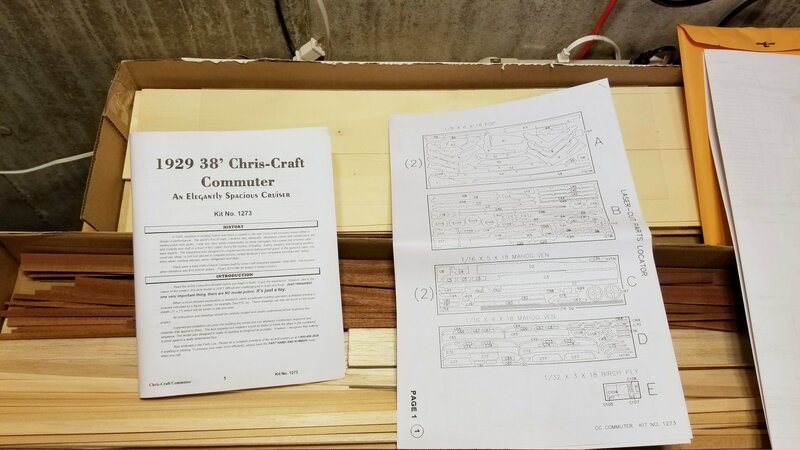 But the instructions caution not to spray the hull until the rub rail is on, and that means I have to do the sideboards (which are painted black) so I can sand them down to meet the hull, and then mount the rub rail on that join. So I think I will sand and spray finish the bulkheads and mount those, and then sand and mount the sides without spraying, then the sideboards, then the rub rail, and then I'll spray the hull and sides. Just a lot of sequencing based on different parts of the instructions that aren't linked to each other in the book. You have to read ahead. Final note on the epoxy. 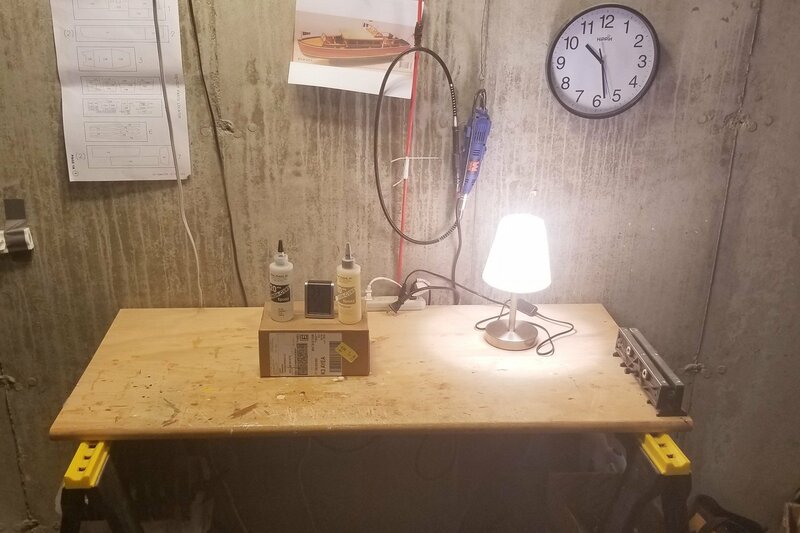 On the second coat, I got some thick parts that I had to sand out, and figured that the epoxy wasn't hot enough, so I put it in a smaller box with the light and a thermometer and heated it to 110 degrees. That, plus small batches, produced a thinner mix that went on better -- but really only lasts about 5-6 minutes in the pot before thickening too much to apply. I'm working my way through the epoxy finishing process -- just started second of three coats. One lesson learned about this epoxy that Dumas supplies (actually made by BSI): the instructions on the bottle say that the pot life is 20 minutes, but there's no way that's the case. I ran into application issues at about 10 minutes, and had to remix. So smaller batches for coat 3. I kept the mixed epoxy at temperature by putting the mixing cup into a bowl of hot water from the tap (ours is pretty hot). 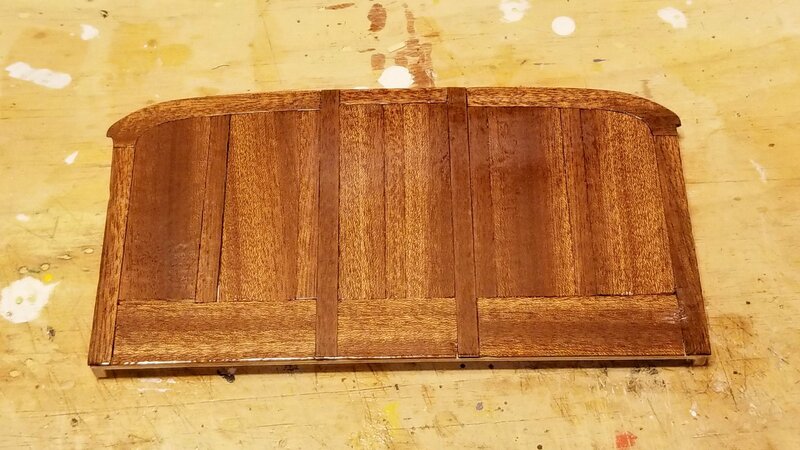 Pictures will follow when I have something nice to show -- but the color of the mahogany with the epoxy sealer is gorgeous. 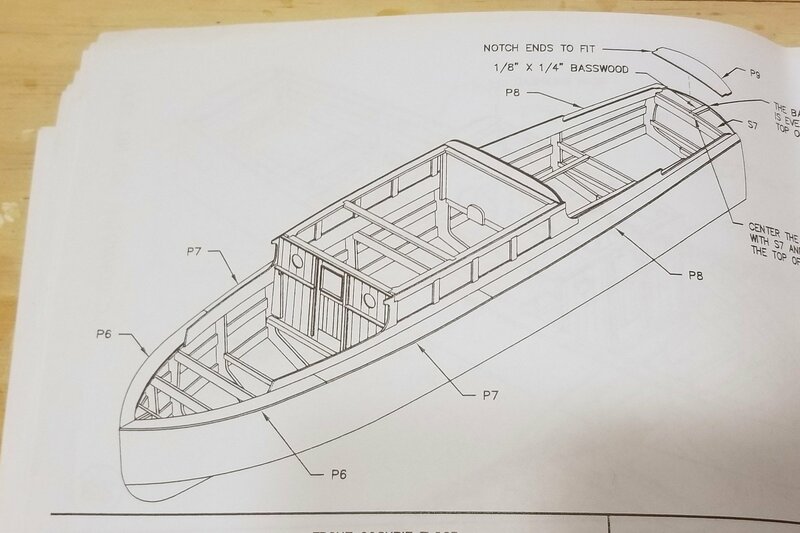 The first picture of one of the drawings shows how the sides fit onto the boat. They side down inside the sheer, so there has to be clearance between the cabin bulkheads and the sheer. 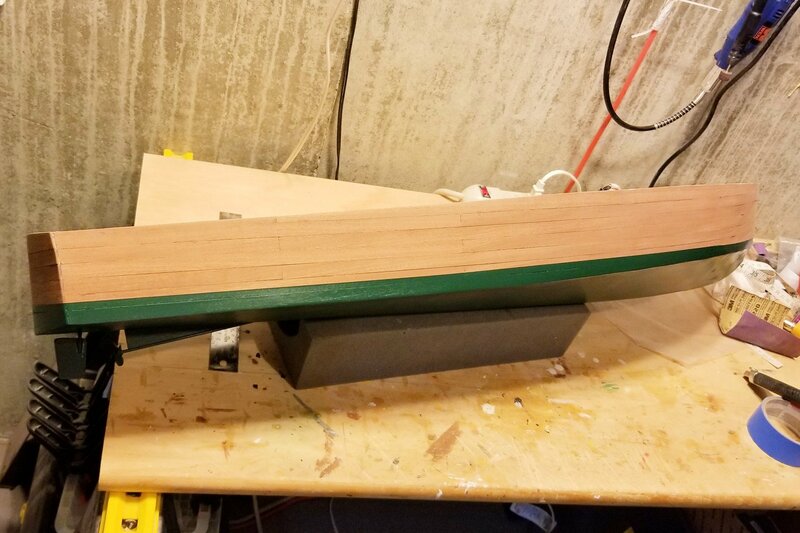 I wanted to make sure everything fit before I did my first round of epoxy finishing, so I dry fitted what you see in the drawing, and sure enough, one of the bulkhead sides needed to be sanded down. Better done before finishing (and certainly before installation!). 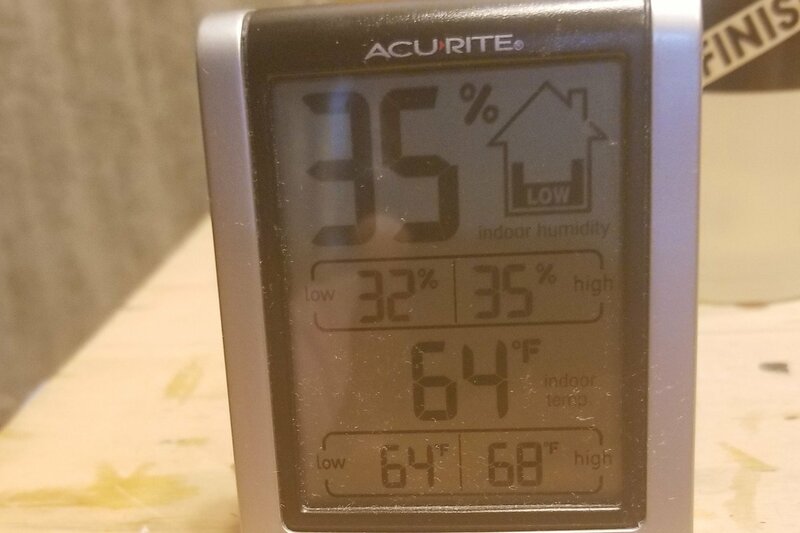 The epoxy says that it has to be done and cured at 75 degrees F, but my workshop is much colder. They suggest using a box and light to achieve that, and as the pictures show, it works. It also has the virtue of warming up the epoxy, which the epoxy suggests be done in a microwave, but I can just imagine either the exploded bottle or the odors permeating that appliance. This way, the bottles are up above 75. The last shot shows 75 degrees, but as I write this it's around 77, which is perfect. 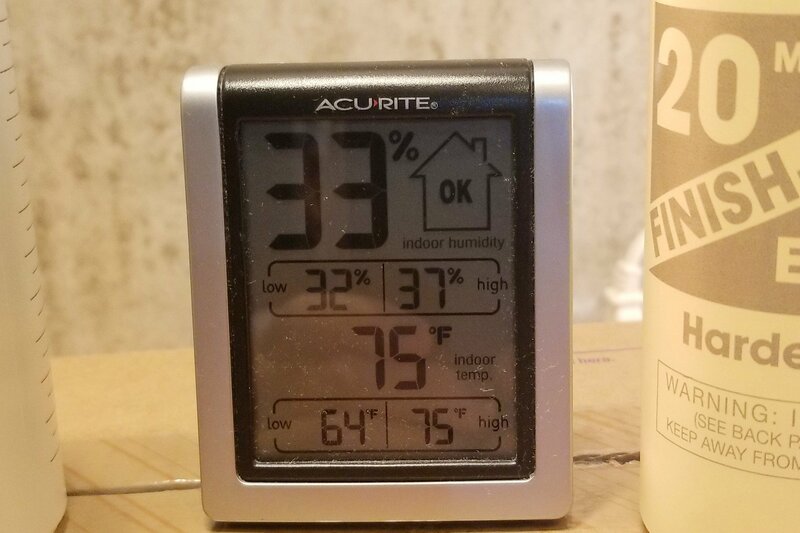 Might get warmer with time, but that's fine. 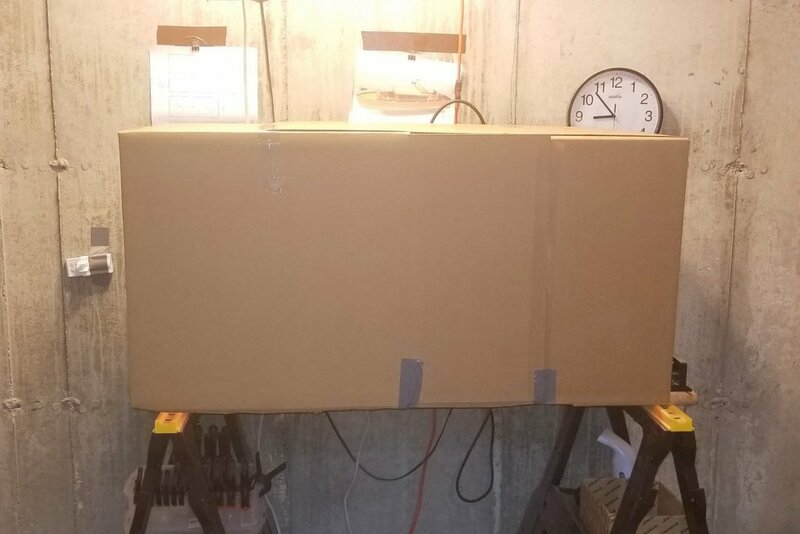 Now I'm ready to start the finishing process for hull, front and back bulkheads, and sides. I'll do them separately and then assemble. I have painted the bottom and the side up to the waterline in Hunter Green. Thanks again to Grant (gjdale) for his excellent tip above about using varnish to seal the edge of the masking tape. The edge really looks good. It will be finished with a striping tape, but having a clean edge to work with will make that better. The instructions are ambiguous about when to do this. In one part, they say that they recommend painting the boat at the end. 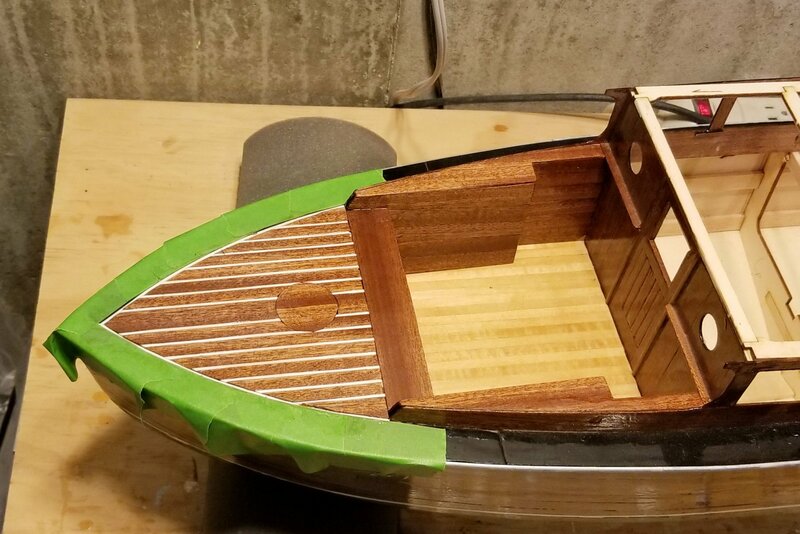 But I didn't want to be taping the boat with the cabins and details on, and this way I can use the same epoxy finish on the entire exterior hull. So build a few more mahogany parts, and then tackle the epoxy finish on the mahogany. 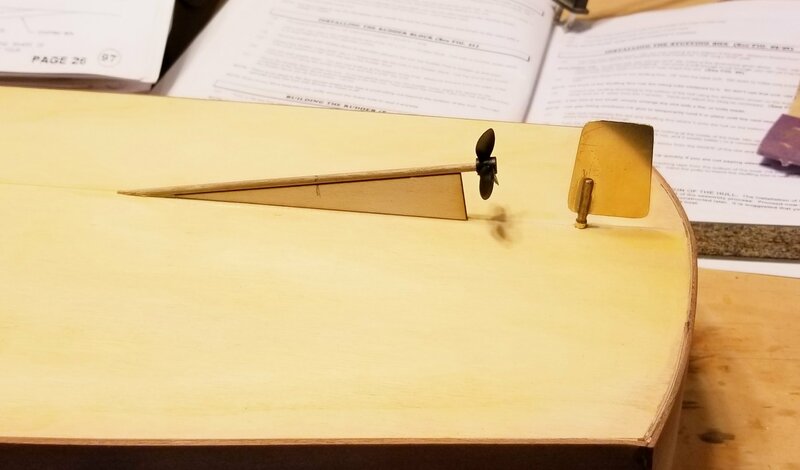 Interestingly, the kit comes with the rudder and some of the linkages for that, but if you don't buy the running hardware kit (which I didn't as this is a static model), you don't get the propeller or the shaft. But you DO get the skeg. So I ordered a prop from Amazon and then fashioned the shaft from a walnut dowel. 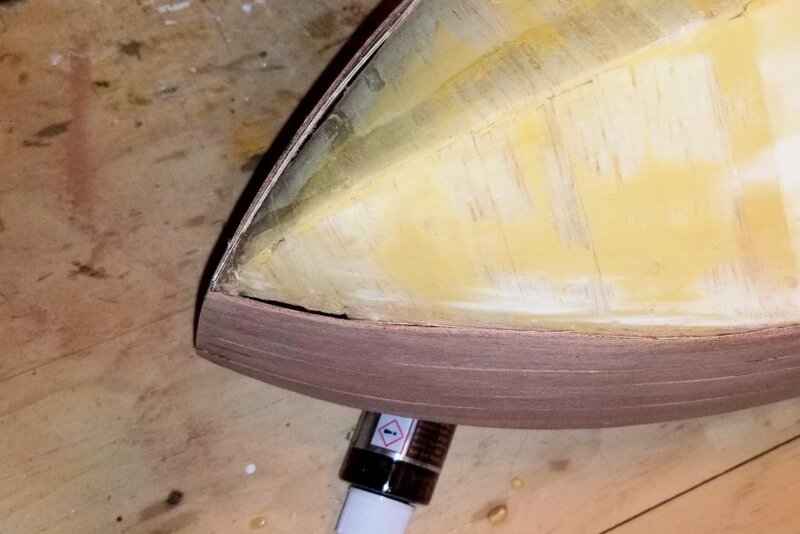 I have brass rod, but since the shaft doesn't need to penetrate the hull -- just be faired up to it as if it does -- I decided to use wood to make the fairing look smoother. All of this gets painted the same hunter green color. I think the prop is probably too small, but it will do unless examined closely. Here are the front & rear cabin bulkheads. Well-sanded except for final fine sanding, but not finished yet. I'm waiting to do that along with the hull, because it's a 3 step mixed epoxy process followed by 3 clear coat sprays, so I want to do a few things at once. Also need to paint the bottom first. All of that will commence when I get back from a one week trip next week. Some drama at the bow. 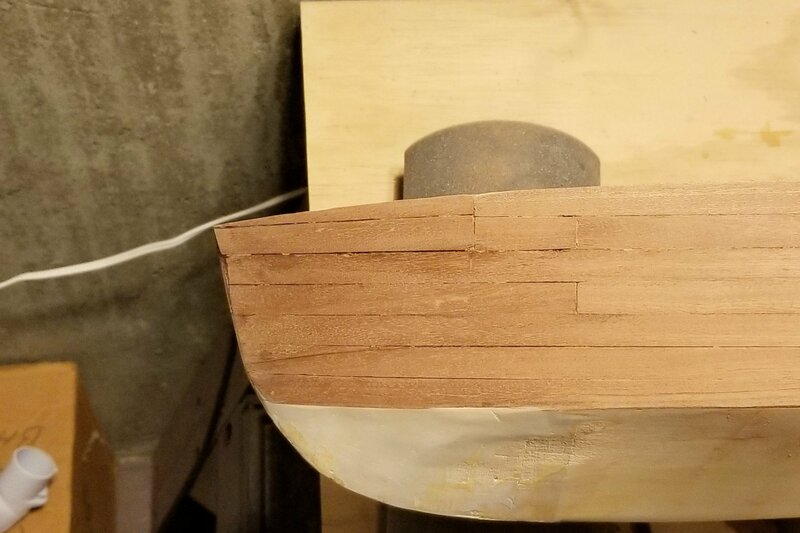 While I was going over the mahogany planking and doing some touch up sanding, there has been an area of the bow where one of the planks was just getting sicker and sicker. Starting to break at the edges. So I bit the bullet and chipped it out (Picture 1) and then fitted new planks in. There are parts of the hull that have more of the kind of space that has opened between the planks that you see here. Not there originally -- the planks seem to have had some "shrinkage". I'm hoping that when I apply the epoxy, it will cause the wood to expand and tighten a bit. My workshop is pretty dry now that it's winter. Anyone have any thoughts on what would happen if I run a humidifier in there before I try to finish the wood? 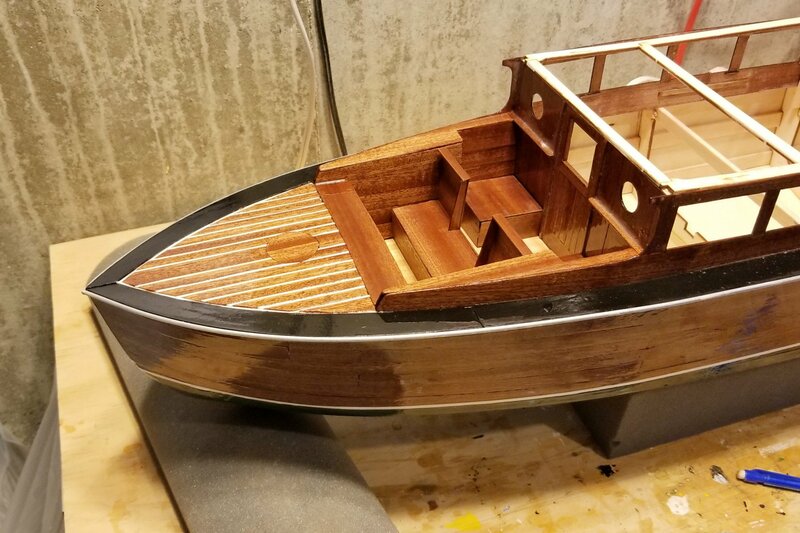 Looking over the hull, I have some planks that are not fully adhered to the first planking. The result is that they won't sand down -- too springy. 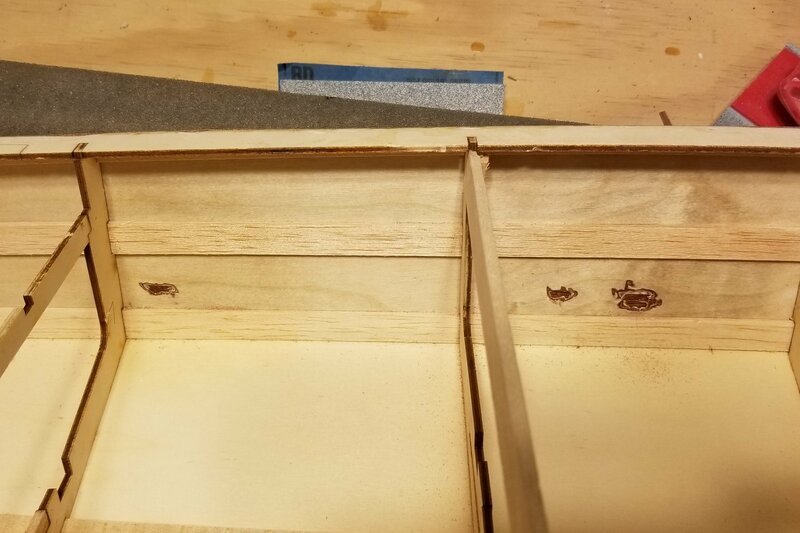 In the past, I've solved this with glue down the edge, but that leaves glue marks. So this time I went in from the back, and ground out small areas where I could apply glue from the back and then pin the planks down. 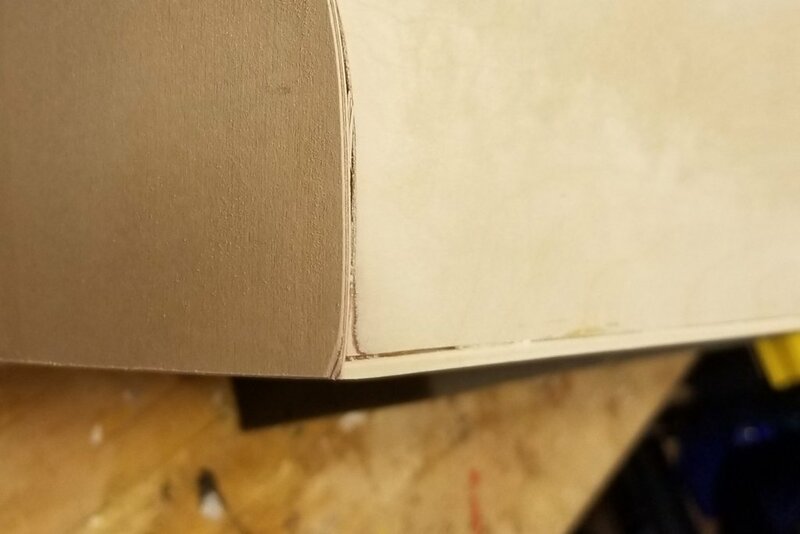 First pic is before gluing, second one is the areas from the back, third is after gluing but before sanding, and fourth is after some additional sanding. Oh what a good tip! 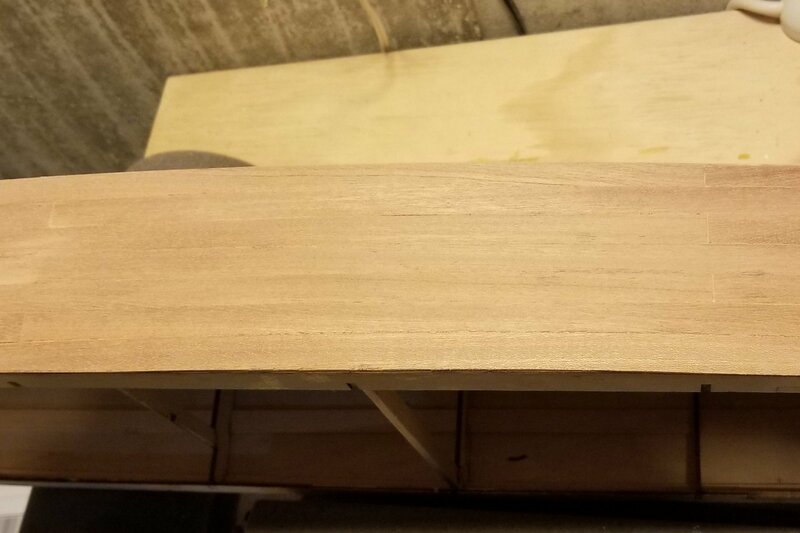 I've now planked the sides and rear transom with mahogany, and I'm pretty satisfied. I haven't hit it yet with the 400 grit -- I'll wait on that until I finish it. See picture 1. 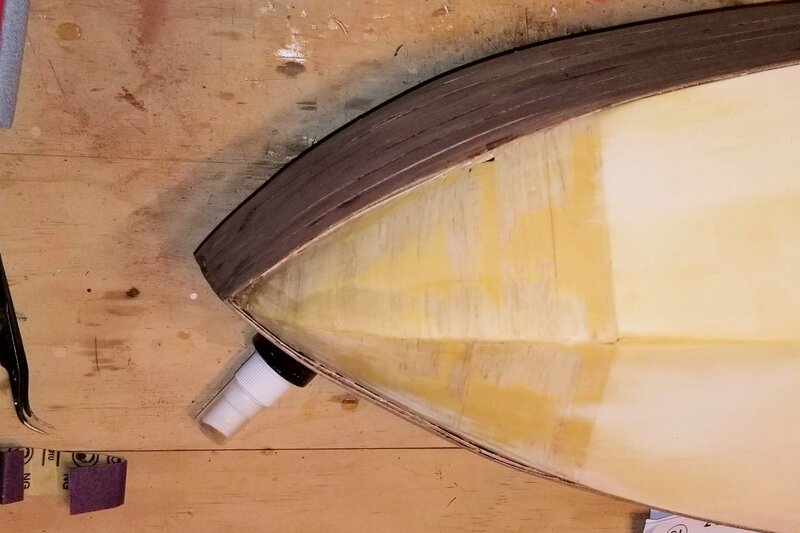 The bow area is planked with individual strips running keel to edge, and they are made of balsa and are flimsy and don't sand down well. I covered them with wood filler to try to smooth them a bit, but that area was still pretty ugly. See pictures 2 and 3. 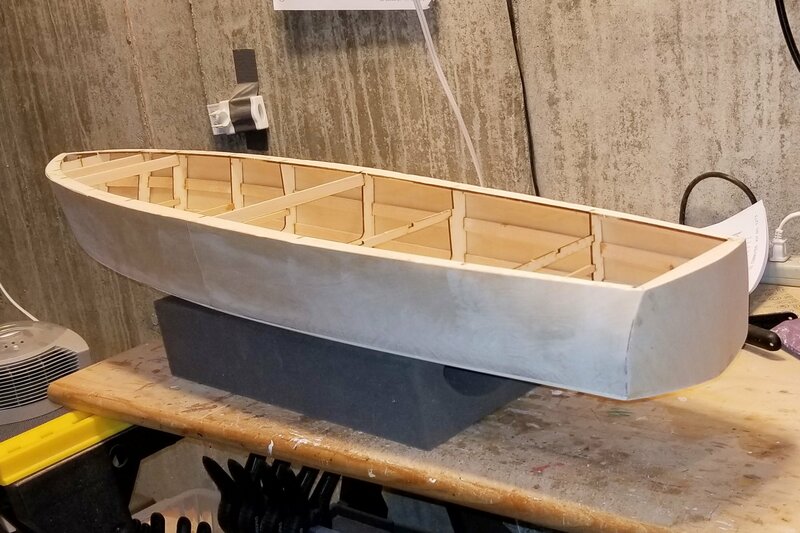 Fortunately, the instructions call for spreading a layer of Bondo onto that area after the mahogany sides go on, and because I've built a Dumas boat before, I had some Bondo on the shelf. 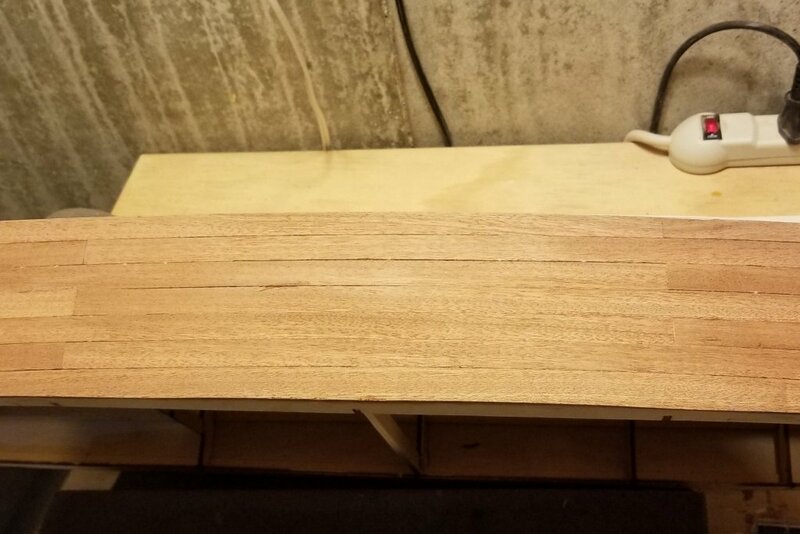 Pic 4 shows the result, and while it's not final-sanded, it's pretty smooth now and the join between the bottom and sides looks good now. 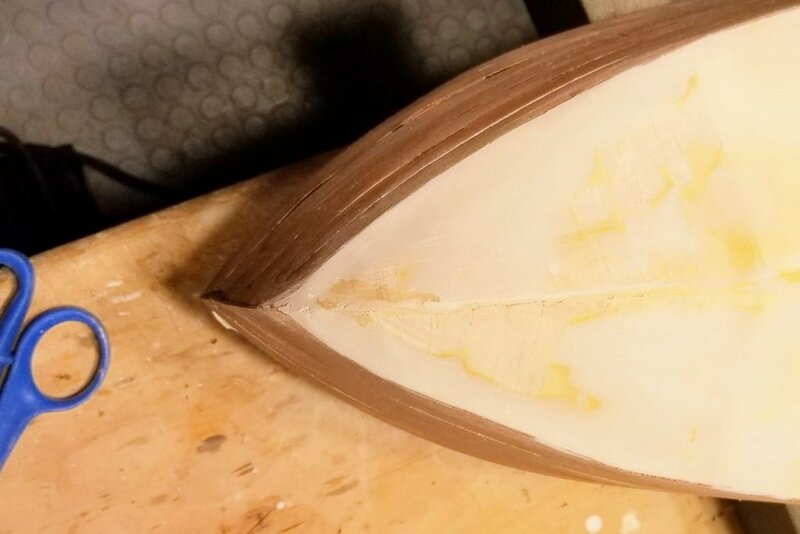 The color changes you see between the Bondo, the wood filler, and the actual wood are actually pretty smooth, although they don't look it to the eye. 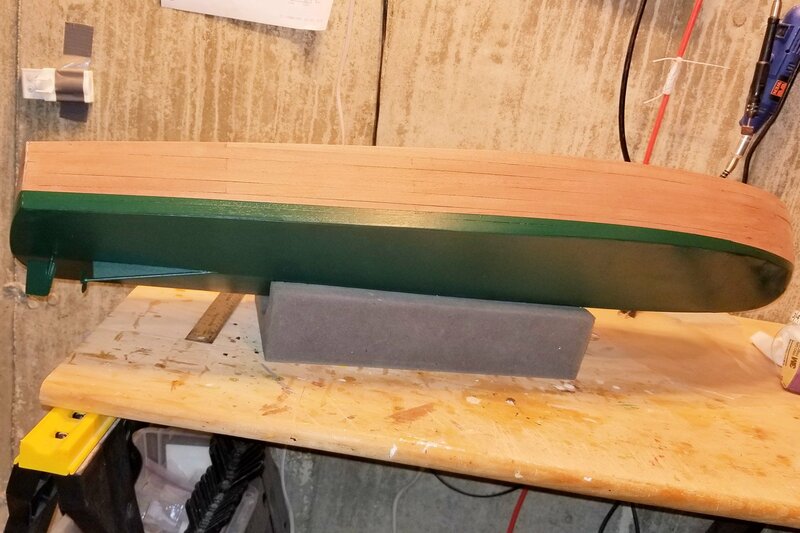 The waterline leaves the bow and travels across the lower mahogany side, so all of the bottom, and all of the join between the mahogany and the Bondo (below the waterline), will be painted bow to stern in Hunter Green. 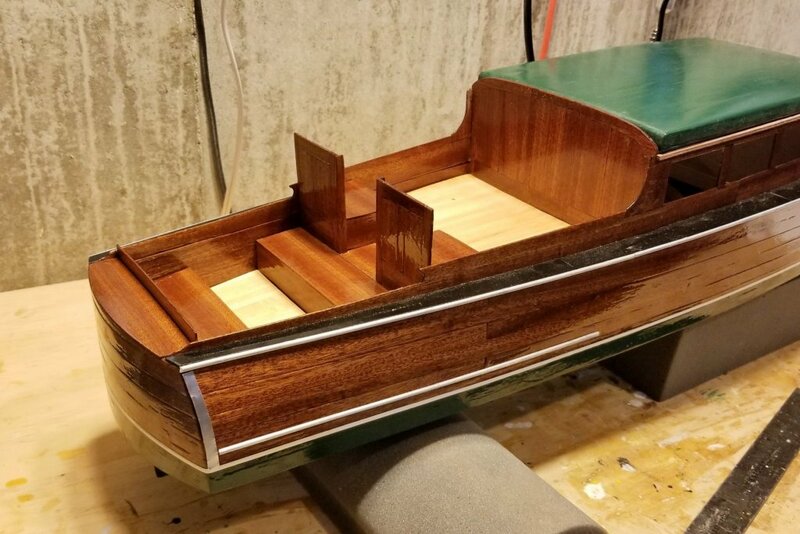 The finished mahogany is above the water line. Now I have to decide when to paint the bottom up to the waterline. 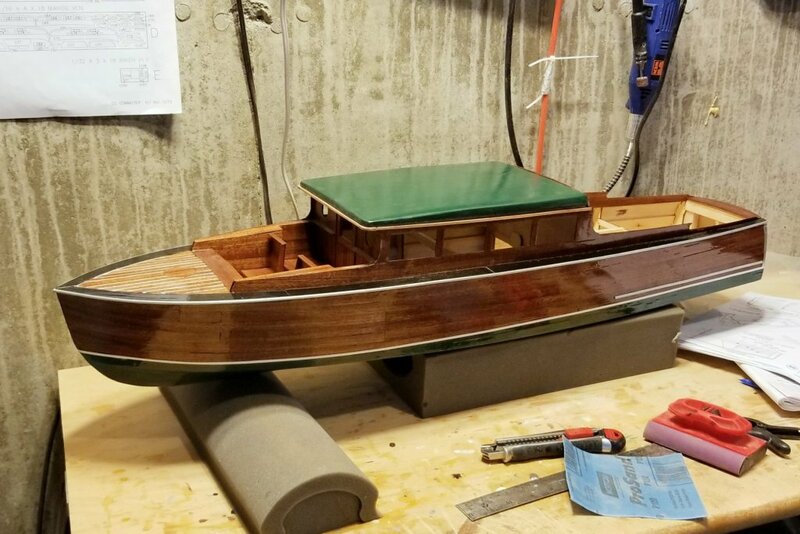 I am paranoid about paint getting under the tape and onto the mahogany, so I'll want to keep the boat oriented so the taped edge faces down. I also don't want to have too much superstructure on the boat when I paint it. So that will be a step coming soon, but I need to read way ahead to see what's coming. Mystery solved. 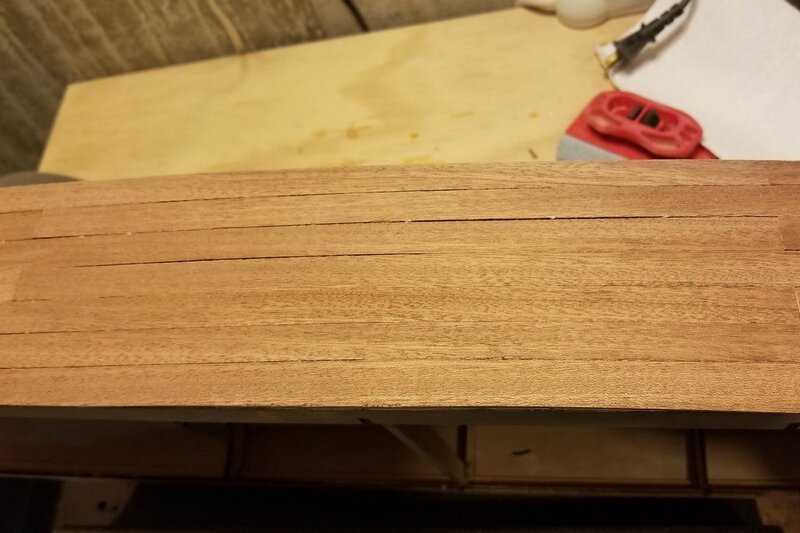 The issue for me was the alignment of the first mahogany strip. Common sense says it should be aligned with the bottom of the side of the boat, where the side meets the bottom. But the instructions say to follow the bottom of the side panel, which if you look at the attached pic would leave a gap. I called Dumas, and the common sense answer is the right one. I think what happened is that they intended the sides to overlap the bottom, and I had the bottom overlap the sides. The instructions really aren't clear about that -- in fact, I think if followed literally they lead to what I did. But no matter -- I can align to the true bottom with no problems. But thought I'd post this for any of you who are getting ready to build one of these, particularly for Tom. Hull now complete through the first planking (I really should say "paneling"). 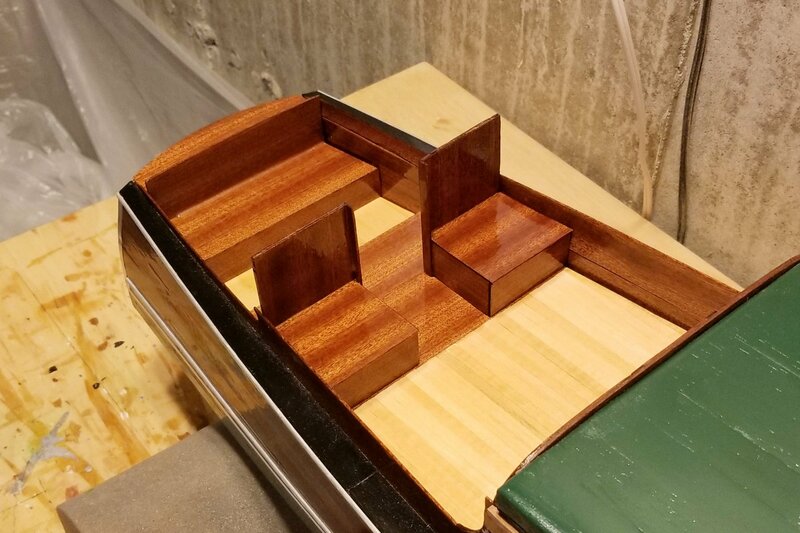 Next step is mahogany strip planking, but I need to ask Dumas a question first about alignment -- the instructions are clear, but if I follow them what will show on the boat doesn't make sense to me. 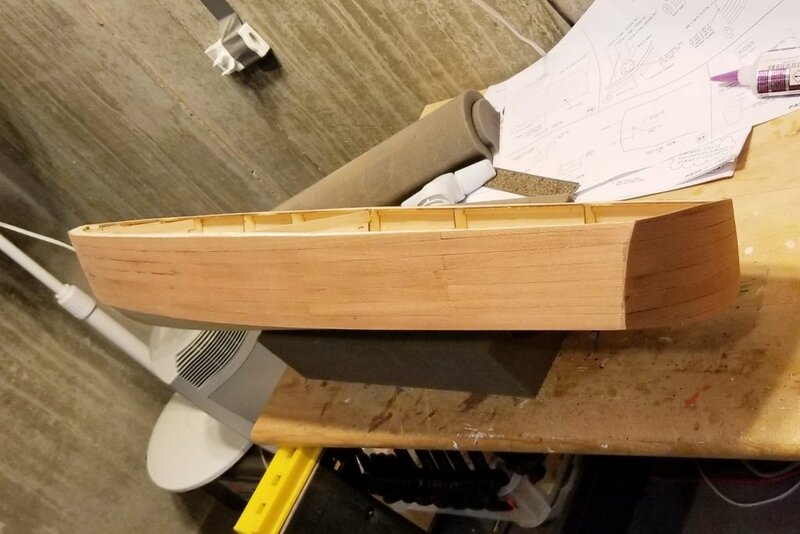 The hull is beginning to take shape. No, a static model. These are so beautiful, I just wanted to build it for display. 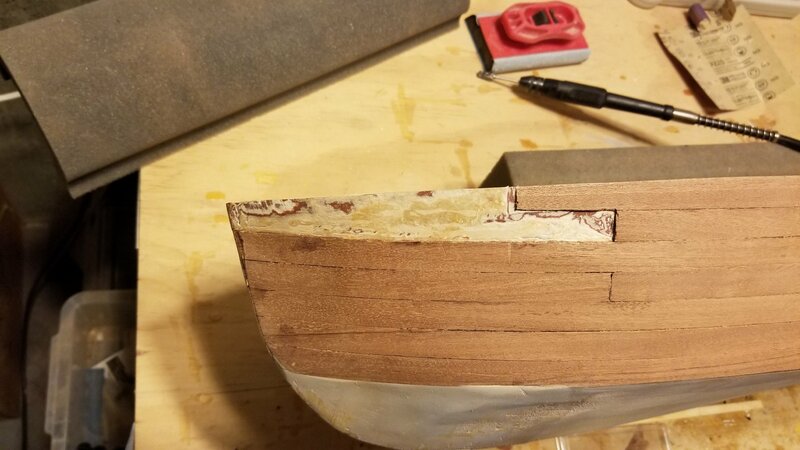 Here's the start of the hull. This was a difficult assembly. 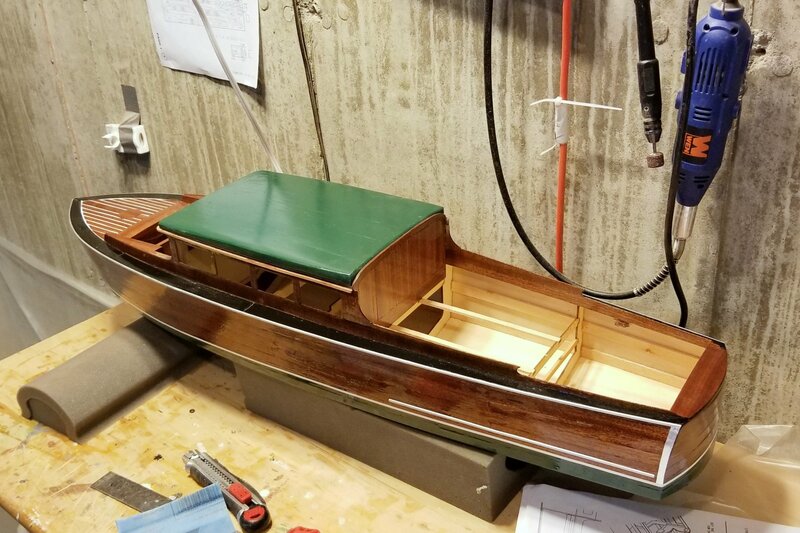 The boat "sheer" is stapled to the workbench, and the instructions say to glue the frames to it, and then glue on the keel. Lots of issues doing it that way. So I glued each frame from bow back to the keel, dry fitted that assembly and let it dry, then glued the next frame, dry fitted again and so forth. Then I glued all the frames to the "sheer" at the same time. 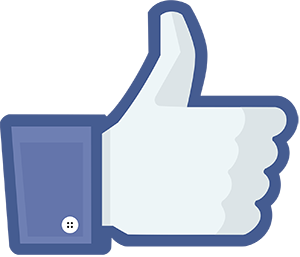 That worked well and the result is what you see. Thanks, Robert. Hope you find it interesting. The frames on this boat are made up from subassemblies. 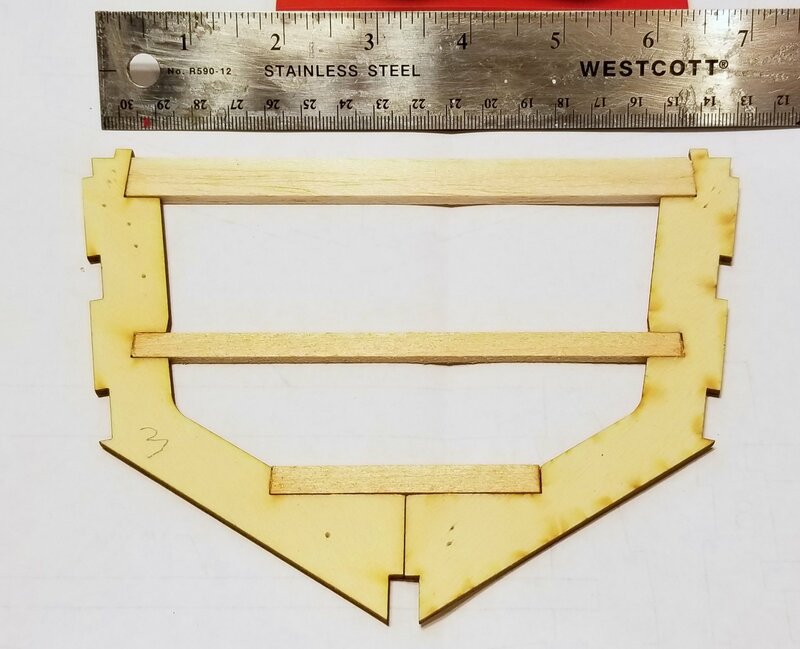 Here's frame #3 (from the bow). Back from my one month trip to Asia and ready to ease back into ship modeling. This kit is part of the Dumas Chris-Craft series. Unlike most Dumas boats, this one has a planked hull. Pictures of the box cover with a close-up showing the model. Lots of wood, unsorted. 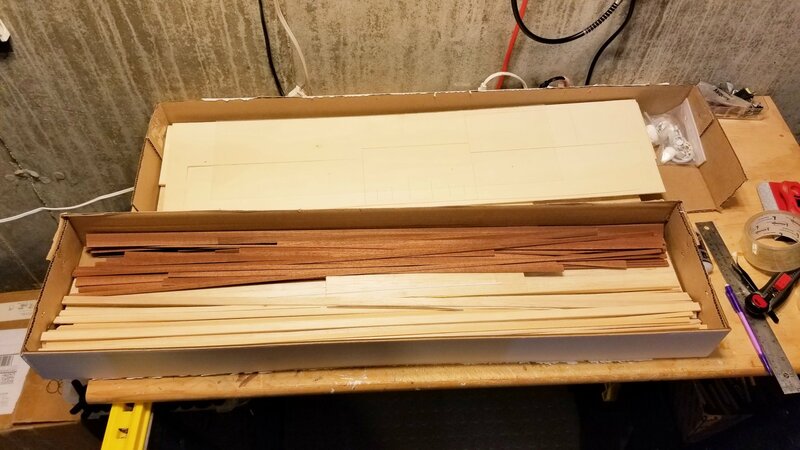 Some good-looking mahogany strips and some very fragile laser-cut mahogany. Manual and lots of charts and drawings. This one should be a challenge -- the manual says it's a very difficult kit. 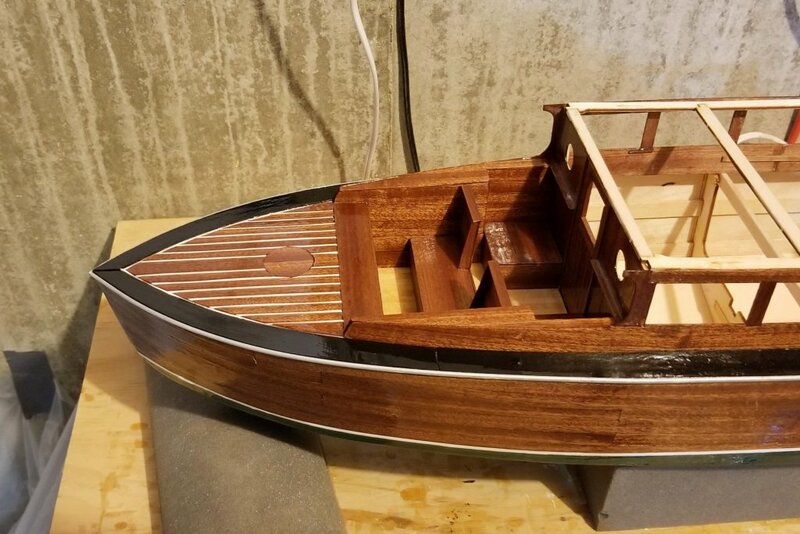 The part I want to get right is the finish on the hull. I'm going to spend some time with the manual before I start on this. She looks more beautiful each time you post. Beautiful work on the rigging, Zappto.